Jiri is a village development committee in Dolakha District in the Janakpur Zone of north-eastern Nepal.Jiri lies at an altitude of 1,905 metres (6,250 feet) and is the eastern-most terminus of the highway coming from Kathmandu.There are a number of lodges available along either side of the main road mainly in Jiri Bazaar.As the closest roadhead, Jiri is now the trailhead for many treks into the Mount Everest region. 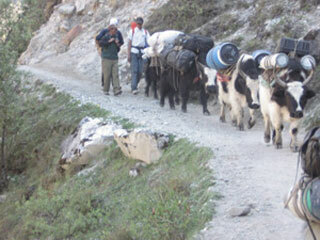 The trek to Lukla will take seven or eight days. Few people actually begin a trek from Jiri, as only 5% of all trekkers who attempt the difficult trek to Everest Base Camp start at Jiri. The other 95% choose to fly into the small airstrip at Lukla, thus cutting off a week of difficult but beautiful trekking.Although the trailhead from Jiri into Sagarmatha National Park is referred to as the "classic route to Everest", the original trailhead actually began at Kathmandu. All early Everest expeditions—including the one led by John Hunt that put Tenzing Norgay and Edmund Hillary on the summit—passed through Jiri. So Jiri is also called the "Gateway to Mt. Everest". Jiri is the home of an ethnic group called the Jirels. Today your guide will pick you up from your hotel early in morning to go for Old bus park to catch the bus to Jiri if you are wishing to take express public bus transportation to go for Jiri but if you prefer private vehicle then private vehicle will pick up from hotel to transfer to Jiri. Although Jiri is only 188 km away from Kathmandu, the journey will take approximately 7/8 hours to reach at Jiri through the Banepa, Dhulikhel, Panchkhal, Dolalghat, Khadichaur, Pakhar, Mude, Charikot, Namdu, Kabre, Mina Pokhari and Thulo chaur then finally you react at Jiri Bazaar (1950m). Overnight at teahouse. We start our trek at the end of the paved road in Jiri. After crossing a stream the track leaves the road and starts to climb uphill through trees to several wooden bhattis at the tiny settlement of Bharkur. We keep climbing to the Mali Danda (2440m), from where there are good views of the peaks near Rolwaling. Beyond Mali Danda we descent into the Khimti valley through the sparsely populated Sherpa settlement of Mali at 2220m and continue our way to the crossing of the Yelung Khola river at 1860m. After crossing the Khimti Khola rivere on another suspension bridge we will reach Shivalaya (1810m) Overnight at Teahouse. Today trek from Junbesi after we cross the Junbesi Khola river and then climb steeply uphill, contouring above the houses to the end of the ridge. From here we have excellent views of Everest, Thamserku (6608m), Kantega (6779m), Kusum Kanguru (6367m) and Mera Peak (6654m). This is the first view of Everest on this trek, although the lower peaks in the foreground seem to dwarf the higher, more distant mountains. 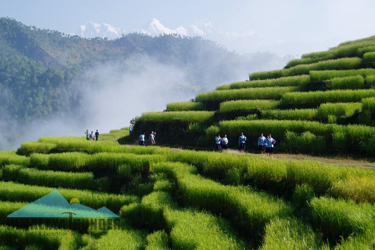 After passing the Ringmo Khola river, the trail ascends to Ringmo village, with its abundant fruit orchards. Beyond Ringmo we climb to the Trakshindu La pass (3071m), where we can see the isolated monastery of Trakshindu, a superb example of Sherpa architecture. We now descent through forests of conifer and rhododendron, passing shepherds’ huts and bhattis alongside the trail until we reach at Nunthala (2200m) Overnight at Teahouse. The trail drops steeply for bit then descends to Thado Khosi gaon there is suspension bridge that you have to cross after that you see the head of the valley Mt. Kusum Kanguru (6367m). After bridge climbs bit to reach at Ghat (2590m) on banks of the Dudh Koshi River just short visit at monastery then little easy walk then after climb again to reach at Phakding (2610m) after that the trail we cross the Dudh Koshi river and climb gently the valley to Toktak (2760m) and Benkar (2710m) The trail keeps close to the river valley and is lined with beautiful blue pine and rhododendron forest that is very spectacular in the spring months, when the flowers are in bloom and also you will see the beautiful waterfall. We will see the snow-capped peak of Thamserku (6623m) & Khumbi La (5765m) at Benkar. We cross the Dudh Kosi River at Benkar. From here it is only a short walk to Monjo (2840m). 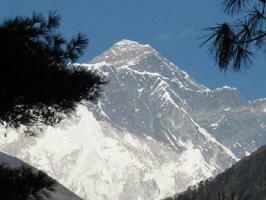 Just beyond the Monjo trek enters the Sagarnatha (Everest) national park where you need to check your permits. After checking the permits the trail steep rocky descend to large farm aftermath cross bridge at Dudh Kosi and follow the west banks. Just short distance up the river is Jorsale (2830m). The trail follows the river for a while, then re-crosses the Dudh Koshi along the river bank and after short ups and downs, makes a steep climb near the confluence of the two rivers (Bhote Koshi & Dush Koshi) then little climb and re-crosses bridge at Dudh Koshi after that the trail follows steeply ascent towards the Namche Bazaar(3440m). One hour before arrive Namche Bazaar from where we may see the Mt. Everest (8848m), Lhotse (8516m) and Nuptse (7879m) first time in your life. Namache bazaar is gate way to khambu. Namche is the main trading village in the Khumbu region and holds a busy Saturday market. There is set a meeting place for the Hindu traders from the lowlands and the Tibetan yak caravans that have reached there by crossing the glaciated Nangpa La pass. Overnight at teahouse. Acclimatization is most important before heading higher. Most off the trekker’s acclimatization at Namche on their trek schedule. Today you may excursion either Thame village or viewpoint as your wish but better to consult with your guide regarding the day trip earlier night. If you prefer to Thame it takes approximately 7/8 hours walking both way go and return to Namche. it is popular for visiting Thame monastery but most of the trekker’s choose the easy option just to go Viewpoint in the stand point of splendid view of the Himalayas including Mt. Everest (8848), Lhotse (8516m), Lhotse shar (8382m), Nuptse (7879m), peak- 38(7591m), Ama dablam (6856m), Thamserku (6623m), Kangtega (6783m), Kusum kangaru (6367), Cholaste (6335m), Tabuche peak (6495m), Khumbi La (5765m) and Kwangde Ri (6011m) etc. overnight at teahouse. Today the trail at first slightly climb up for a while up to the Chor camp at Namche Bazzar then continue easy level walk to kyangjuma 3550m. Along the way from chor camp at Namche bazaar to kyangjuma you may enjoy incredible view of Mt. Everest (8848), Lhotse (8516m), Lhotse shar (8382m), Nuptse (7879m), peak- 38(7591m), Ama dablam (6856m), Thamserku (6623m), Kangtega (6783m), Kusum kangaru (6367), Cholaste (6335m), Tabuche peak (6495m), Khumbi La (5765m) and Kwangde Ri (6011m). From kyangjuma the trail follows for a while easy level walk through Rhododendron forest to sanasa .There is two way from where one way left hand side leads to the Gokyo valley trek and another way right hand side leads to the direct Everest base camp trek. From sanasa the trail descends gradually through pine forest to lausasa where there are a few teahouses aftermath the trail drops steeply through the pine and Rhododendron forest to Phungi thanga, a small settlement on the river banks of the Dudh kosi at 3250m. The trail climbs steeply at beginning then a gradual ascent through blue pine and Rhododendron forest at the hill top of Tengboche Monastery at 3867m. The view of sunset and sunrise as well as magnificent view of the Mt. Everest including other Himalayas form Tengboche probably most amazing during your treks. Tengboche monastery is one of the beautiful monasteries in solu khumbu area as well as the religious center of the whole ‘Sherpa land ‘entire solu khumbu area. Overnight at teahouse. From Tengboche the trail at first descent to Deboche (3820m) through a forest of birches, juniper, conifers and rhododendrons. There is a small settlement as well as monastery at Deboche. The level trail further ahead from Deboche to Imja khola passes many mani walls in a deep rhododendron forest. Along the way from Tengboche before crossing Imja khola you can often see the musk deer, pheasant (national birds of Nepal) and blue sheep etc. After crossing the Imja khola the trail climbs past some magnificently carved mani stones to lower pangboche (3930m). Beyond pangboche the trail lead level and gradually up to somare (4010m) then level walk to orsho (4190m). There are two trails further ahead from orsho whereas one trail higher up left hand side leads to Pheriche and lower trail right hand side above Imja khola leads gradually ascend to Dingboche (4410m).during the day you can see amazing views of Mt. Everest (8848), Lhotse (8516m), Lhotse shar (8382m), Nuptse (7879m), peak- 38(7591m), Ama dablam (6856m), Thamserku (6623m), Kangtega (6783m), Kusum kangaru (6367), Cholaste (6335m) and Island (6189m) overnight at teahouse. Today, the trail follows western side of khumbu valley ascends gently through meadows nearby the glacial moraine after that ascends and descends in the rocky path with some rounding the bands. Along the way you can enjoy incredible views of Pumori (7167m) Lingtren (6713m), Khumbutse (6639m), Nuptse (7879m), Lobuche east (6090m) as well as Khumbu glacier and icefall. After finishing several bands you will a bit descends to Gorak Shep (5140m). After reaching Gorak Shep you may have your lunch and leave your bag pack at teahouse then start your journey to Everest base camp (5364m). 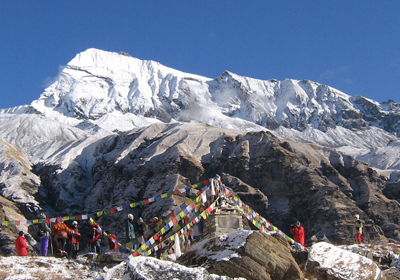 You will spend about 4 and half hours trek up to Everest Base Camp and back to Gorak shep. The trek trail is on glacier and snow capped rocks. You can also see many small frozen lakes around the Everest Base Camp. There are several mountains including Pumori (7165m), Lingtren (6713m), Khumbutse (6639m), Nuptse (7879m) and Lhotse (8516m) but you can’t see the mount Everest (8848m) from Everest base camp although you will see it along the trail. The most impressive view from Everest base camp is the Khumbu icefall. After enjoying beautiful moment at the Everest base camp then return back to Gorak Shep. Overnight at teahouse. Today early in the morning from Gorak shep hike up to Kala patter for magnificent view of the numerous Himalaya as well as breathtaking view of sunrise. The trail from Gorak sheep to Kala patter at the beginning steep climb up approximately half an hour reach the flat land where have been attending Nepal government cabinet meeting regarding the issue of the global warming in 2009.it was first cabinet meeting in such a high place in the world. Aftermath the trail steep climb with lots of bends finally you reach at kala patter after that about 50 meters steeply with rocky climbing to summit the main Kala pattar (5545m). Today you may see excellent view of sunrise on the Mt. Everest (8848), Lhotse (8516m), Nuptse (7879m), Ama dablam (6856m), Thamserku (6623m), Kangtega (6783m), Kusum kangaru (6367), Cholaste (6335m), Tabuche peak(6495m) Lobuche peak (6090m) , Lingtren (6713m), Khumbutse (6639m), Lho La ,south col, changste as well as Everest base camp, Khumbu Icefall and few lake. Once you are at the kala pattar you may feel you are touching Mt. pumori and close-up view Mt. Everest. Finally the dream comes in true then will return back to Gorak shep have a breakfast continue trek heading down through Lobuche and Dughla. Little further from Dughla you will cross the river comes from Everest base camp and khumbu icefall then you will meet two trail where one way left hand side goes to Dingboche and lower one right hand side goes to Pheriche . From here easy walk in the valley to pheriche (4260m). Overnight at teahouse. From Pheriche at first the trail leads level walk in the valley for a while then descent to Imja Khola and cross a bridge then ascend to the hill where is a few stone memorials of climbers. After that the trail leads slightly descends to Orhso continue level walk to Somare then slightly descents and a bit ascend for a while then level walk to two way junction where one trail higher right hand side goes to Phortse village via upper Pangboche and another lower trail left hand side goes to Tengboche through lower Pangboche. Beyond pangboche the trail descends past some magnificently carved mani stones to the Imja Khola, which we cross via a steel suspension bridge high above the river at a spot where it rushes through a narrow cleft then to Debache and a short steep climb to Tengboche through a forest of birches conifers and rhododendrons. Finally you reach at Tengboche(3867m). You may enjoy the breathtaking view of sunset and sunrise as well as magnificent view of the Mt. Everest including other Himalayas from Tengboche. Tengboche monastery is one of the beautiful monasteries in solu khumbu area as well as the religious center of the whole ‘Sherpa land ‘entire solu khumbu area. Overnight at teahouse. Today we trek back along the Dudh Kosi River through a magnificent rhododendron forest and past brilliant waterfalls. Shortly before reaching Namche, the trek takes us through a pine forest, where musk deer often graze in the early morning. Arriving in town, we may see lowland porters, highland Sherpas, and Tibetan people and again you reach in Namche bazaar. After Namche the trail descend to Larja dobhan (confluence of two rivers) though the pine forests before you reach at Larja Dobhan you may get last opportunity to see Mt. Everest and Lhotse. After cross the bridge at Larja Dobhan the trail descends for while and then walk along the Dudh Koshi River. Re-cross the Dudh Koshi continue level walk to Jorsale. Beyond the Jorsale the trail leads a bit ascend after that re-crosses the suspension bridge then short steep climb to Monjo (2835m) overnight at teahouse. From Monjo the trail leads descends for a while and cross Dudh kosi over the suspension bridge then short easy level walk to Benkar. After Benker the trail follows a bit up and down and level walk along the Dush kosi valley then after re-crossing the suspension bridge you reach at Phakding (2610m). Beyond Phakding the trail follows a short descends continue level walk for a while then short steep climb up passes several Buddhist setups at Ghat village. Aftermath short steep climb up to Thado kosi and a bit descends re-cross the small bridge then climb up a short distance after that finally you re-crosses last long suspension bridge of your trek. The trail after the long suspension bridge follows the up wards route as far as Chablung, then turns off towards Lukla. The broad trail at Chablung leading uphill to the left hand side climbs steadily past a few (bhattis) local inn and houses. From there the trail follows through scrub forest above the school and houses of Chaurikharka village then final climb up of your trek about half and hour reach lukla Tamang tole where a new settlement with houses and Bhattis then short distance walk to approach to Hotel close by Lukla airport. Overnight at teahouse. In the morning, we take the tiny aircraft to flight from Lukla to Kathmandu which is very interesting scenery flight journey on the earth. After arrival in Kathmandu airport we drive you to hotel.